Microsoft is trying to sweeten the deal in its bribery -- er, sorry, promotion -- to get you to use its Live.com search engine. The company has just announced plans to make its Cashback program even more instant. Am I the only one getting tired of this? The Cashback initiative, first launched in May, essentially offers money in exchange for using the Live search protocol. When you find and buy products through a Live search query, Microsoft sends you a certain percentage of the cost back. Initially, that payment process took about 60 days to complete. With Monday's new development, eBay-oriented purchases will result in cash being deposited into your PayPal account instantly instead. Basically, Microsoft is running a variation on a psychological concept known as operant conditioning. 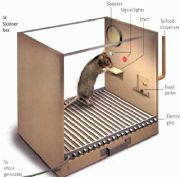 Think of yourself for a moment as a mouse in a scientist's box, being trained to peck a lever (which, in this case, represents a Live search query). Originally, your reward -- a food pellet -- came out two months later. Now, your pellet comes out within seconds. It's straight out of a Psych 101 textbook: The more instant the reward, the more likely the animal is to be trained on the behavior. It only makes sense. B.F. Skinner would be proud. Here's the problem, though: Despite Microsoft's recent claims that its efforts were succeeding -- those claims, by the way, were based on a study Microsoft itself commissioned -- the numbers just don't add up. Offering a few bucks may get people to use the service once, but it's not enough to get them to leave their preferred product behind for good. So since starting the Cashback program, Microsoft has actually lost almost 6.6 percent of its search market share. Google, in contrast, has continued its upward climb, gaining 2.4 percent -- and without paying its users a dime. For crying out loud, even Yahoo has managed to inch upward despite its endless public humiliations and nearly nonstop stock plummeting. "We have no plans to pay users to use our product," he said. "Our fundamental belief is that we should compete by building a great user experience ...rather than paying users nickels and dimes." Gimmicks don't equate to long-term customer loyalty -- powerful products and services do. All the Cashbacks, SearchPerks, or even rumored rebrandings can't mask what's beneath the surface. You can call the Big Mac a "gourmet steak" and give me five free coupons to try it. I might even redeem a few of them. But in the end, I'm going to go back to my favorite local burger joint. Why? Because I know it, I like it, and I trust it. And in the end, it just tastes better. Right now, Google is that tasty little place. Sure, it may be too greasy every now and then, and sometimes the cook does shortchange you on fries. When it comes down to it, though, it's still the best burger around. Microsoft may be offering some flashy deals, but its offering always seems to come up a few pickles short of satisfying -- and putting it in a shinier wrapper or giving me an extra quarter off the cost isn't going to change that. Man, all this search engine talk is making me hungry.